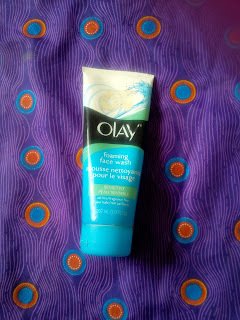 OLAY FOAMING FACE WASH FOR SENSITIVE SKIN - Pretty Mundne!!! I finally ran out of my acne.org cleanser which I talked about in my HOW I FINALLY CURED MY ACNE POST and needed something equally as gentle to replace it and so I went to the acne.org website and discovered that Dan the owner of the website always gives other options which could act as substitutes to his products. Dan suggested that OLAY FOAMING FACE WASH FOR SENSITIVE SKIN was a good alternative (He also suggested Cetaphil but I couldn't find this at the time). Formulated specifically for the special needs of sensitive skin, this gentle cleanser refreshes and cares for your skin. Rich foamy lather.100% soap free. Allergy and dermatologist tested. DIRECTIONS: Wet hands and face. Dispense a small amount of product into hands. Add water, work into lather and massage on skin. Rinse off with water. INGREDIENTS: water/eau, glycerin, sodium myristoyl sarcisinate, PEG-120 methyl glucose dioleate, sodium lauroamphoacetate, aloe barbadensis leaf juice, polyquaternium-10, PEG-150 pentaerythrityl tetrastearate, glycol distearate, sodium lauroamphodiacetate, sodium trideceth sulfate, citric acid, disodium EDTA, phenoxyethanol, DMDM hydantoin. This product first of all lacks everything I love my cleansers to lack. 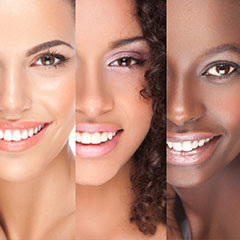 It has no oil(perfect for oily skin), no fragrance and no soap. This cost me 1875 naira and I got it at Akwa ibom state (I realized that its a little tough to get here in Abuja). This cleanser is really gentle on the skin which is very similar to the acne.org cleansers and this makes me love it even more. While I miss my acne.org cleanser, this has been an amazing substitute. I have gone through a whole tube and about to go through another. 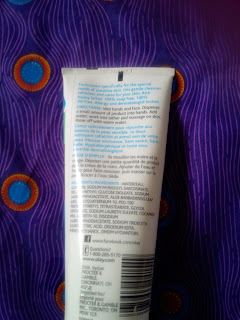 It does not over dry, irritate or break me out and I have really sensitive skin. LONGIEVITY: LASTED ME AN ALARMING 3 MONTHS AND COUNTING. What cleansers have you been trying lately? Please do leave a comment below I will be happy to hear from you.